Carole's Chatter: Oh dear, I don't have one... the indomitable Julia Child! 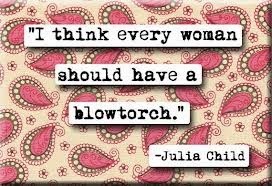 Oh dear, I don't have one... the indomitable Julia Child! I don't have one either. I do! I feel very empowered on those rare occasions that I use it - and they are fun too! Great for a crunchy creme brulee topping. I don't have one, yet, either. But I just gave one as a bridal shower gift to my soon-to-be niece who loves French cooking.